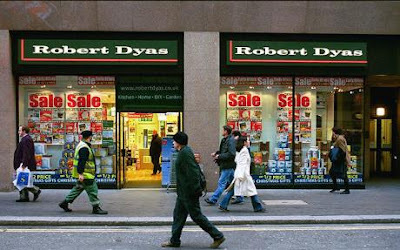 Scene: Robert Dyas on the Strand, Sunday, 7 March 2010, 11:12 a.m.
ME: (to sales assistant) "Hi, I'm looking for a heater. Do you have any?" SA: "Um ... a what?" ME: "A heater. Like, you know, a convector heater." SA: (points to heaters stacked in the corner) "We have some over there." ME: (looks at my watch) "Great. Listen, I have to go to the gym, but I'll be back in an hour. Any chance you can hold two of those for me?" SA: "Um, but we can only hold items for three days." ME: (speaks a little slower) "I'll be back in an hour. Do you think you can hold it for me for an hour? Would that be ok?" ME: "Great, the name is Jaime." SA: (stops taking the boxes) "Ok, so who's coming to pick them up? You or Jaime?" ME: (pause) "I am Jaime. I'll be back in an hour." ME: (to the same sales assistant) "Hi, can I get these batteries and ... the two heaters I had on hold?" ME: (points behind him) "Yeah, those two heaters right there?" I'm not saying they're genii, but you can't really blame them in this instance. In this country it isn't typical that someone would waltz into a shop (that's probably a "store" to you) and demand that they don't sell certain items, just in case you fancy coming back later to buy them, and oh no, you can't possibly be bothered to actually buy them now because you have something far more important to do. In fact, I believe it would seem positively arrogant. Also, "Jamie" (no matter how you spell it) is a boy's name here, so that would account for that misunderstanding. With respect, to the OP (that's original poster), you've entirely missed the point. I inquired about holding two convector heaters - not "demanded", which is quite different (you might want to reconsider your diction there) and according to Robert Dyas store policy, as evidenced in my post, they hold items for three days. Mr. Intellectually-challenged was unable to decipher the difference between "one hour" and "three days". So no, I disagree - I don't believe it's positively arrogant to ask for a service that is available. What I *do* find positively arrogant, however, is someone who doesn't read or understand something thoroughly and makes patronizing (that's probably "patronising" to you) criticisms or judgments based on that self-imposed misunderstanding. The name 'Jaime' is both a boys and girls name here in the UK. I don't know where you are referring to as 'here', but please do not include the entire UK in your closed in box. And where is the law that says, you can't walk in to a shop, walk out and walk back in later? This is hilarious, Jaime. You should send it to http://notalwaysright.com/. To the OP, asking a store to hold something for you is very common and not arrogant at all. If the store prefers not to, all the employees have to do is say so, end of story. Many stores have policies like Robert Dyas' whereby held items are returned to inventory after a certain amount of time, ensuring satisfaction on both the customer's and store's ends. No fuss, no muss. Why so angry at our dear Jaime? We think this BS OP is just an old, confused and crotchety lady. She might be still living in her generation when those services did not exist and no girl was named Jamie. This post should not have caused such an over-reaction. If she doesn't like this Jamie's attitude, she should not read her blog. That simple. It is not necessary to point her finger.